"I use a 5 to 6 pound roast for the following recipe. You can double or half the recipe depending on how many you are cooking for." In a medium bowl, combine the soy sauce, Worcestershire sauce, garlic powder, onion salt, browning sauce and water. Place roast in a roasting pan ribs side down and poke deep holes in the roast with a knife. Pour the marinade over the roast. Using a baster, squirt marinade into the holes you created with the knife and over the entire roast a few times. 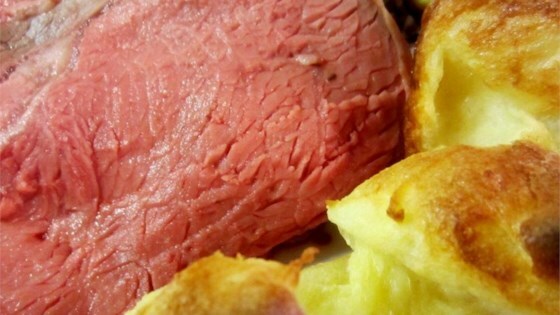 Remove roast from oven and reduce temperature in the oven to 200 degrees F (95 degrees C). When oven has reached 200 degrees F (95 degrees C), return roast to oven and continue cooking for 18 to 22 minutes per pound, or until internal temperature reaches 145 degrees F (65 degrees C). A flavorful, melt in your mouth, classic Christmas dish. I tried this with out the browning suace..it was good but would like to add does anyone know what the browing sauce is? I tried this because Hubby wanted me to, I knew better. This is one way to ruin a great cut of beef and make a huge mess. Highly suggest continued injection of marinade into roast to keep it moist during cooking. Marinade provides excellent flavor.